Ten years ago this morning, I was up early (as I am this morning) taking a walk up Gibraltar Road in the mountains high above Santa Barbara. It was so very peaceful, the stars were sparkling, it was warm, and I remember how the moment took my breath away. I was feeling so fortunate to be staying at a beautiful mountain monastery and to have gotten our Courage to Lead program to the point of launch after a year of recruiting senior nonprofit executives to this retreat-based leadership program. It hadn’t been easy getting people to sign up for something none of them had experienced before, nor getting them to commit time they didn’t feel they had to invest in themselves. But here we were, and it had all come together. 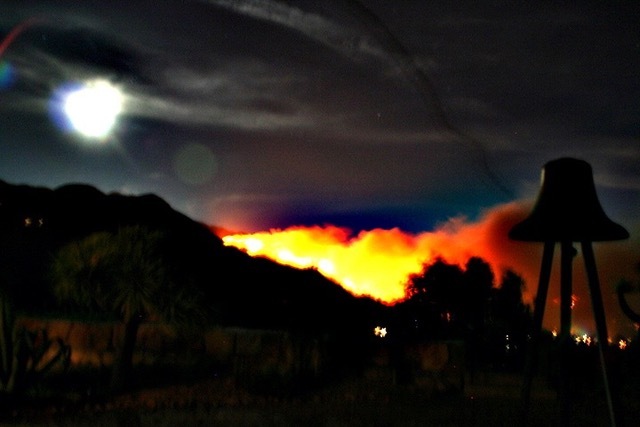 I couldn’t have imagined that 12 hours later, that hillside would be on fire, we’d all be fleeing the Tea Fire in the dark, and hundreds of Santa Barbarans would be in the process of losing their homes. Nor that our beautiful retreat center Mount Calvary Monastery (which had been standing since the 1930’s) would burn to the ground that evening. I also could not have imagined that from this beginning, our Courage to Lead program would grow and flourish and that ten years later we would have 170 alumni leading critically-needed work in their communities all over Southern California and beyond. Nor that a decade later, Courage to Lead would be just one of four ongoing social sector leadership programs we run through our nonprofit organization, Leading From Within. Life is funny that way. Some things – like the Tea Fire – you would never have chosen, but they become integral to your story and a catalyst for the growth that comes next. People’s capacity to transform pain and loss into growth and community and possibility is a constant through-line of human history. Generations before us have experienced so much more trauma and tragedy and hurt than we do in our modern lives. We are a resilient species, and that resilience is being put to the test. This morning, fires are burning today across our state, homes and lives are being lost, and exhausted firefighters are putting their lives on the line to protect their fellow citizens. My colleagues and Courage to Lead alumni and I have been deeply impacted by the fact that just 10 months ago, another fire-induced tragedy led to the destruction of our beloved retreat center of the past decade, La Casa de Maria in Montecito. And going forward, it seems clear that climate change will lead to more frequent destructive natural disasters like this in our state and across the globe. We’re going to need that human capacity for resilience that we’ve evolved over many millenia. On an island of sanity, the sanity is in treating people…as human human beings. Humans being human are wonderfully talented. Generally, people are internally motivated when they believe in what they’re doing. We are naturally creative when we want to contribute. All people want to belong and feel part of a community…. People need visionary leaders. Not charismatic demi-gods or Masters of the Universe, but people they trust because they embody the values and qualities we’re working toward. Leaders don’t have to be perfect, and it helps to make one’s personal struggles and challenges visible. But people need to see what’s possible. That it is possible to live with integrity. That humans can still live and work well together. That we can still behave as human human beings….That is why we need leaders. And why leadership can be a noble profession. I don’t know where we’re headed from here, but I do see our Courage to Lead community as one of Wheatley’s “islands of sanity.” For the last decade, our collective work has taught me more about what is possible in community and relationship than anywhere else. Though we live in a disorienting time and it’s hard to know how to address all that ails us, Courage to Lead reminds me of the beautiful capacity of our species to lead and love and care for one another. And it’s taught me how to cultivate the conditions that bring out the best in people and invite them into healthy relationship. These feel like core responsibilities of leadership, and I’ve been learning them with so many of you over the past decade. For that and so much more, I’m deeply grateful. 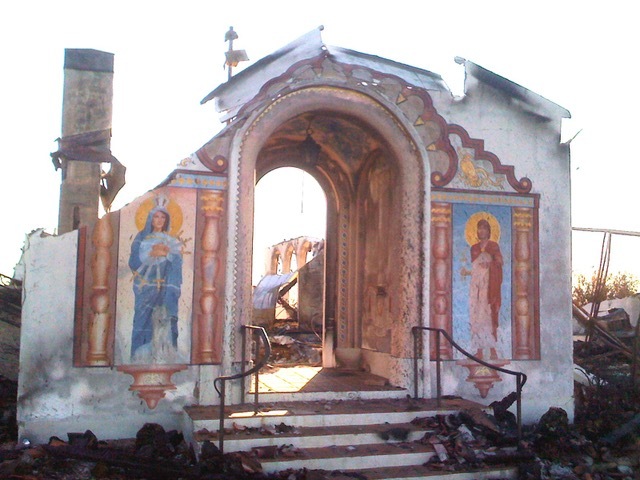 After the Tea Fire in late 2008, I wrote the article below (with pictures) for the Center for Courage & Renewal blog about our experience evacuating Mount Calvary Monastery on the night of November 13, 2008, exactly one decade ago. I share it again below. In the Courage world, fire is a wonderfully positive metaphor. There’s the fire of vocational calling, the fire of passion, and fire as the burning fuel that drives us out into the world with courage. There’s fire’s warming capacity, or how fire allows the artist to soften the glass or harden the clay to make things of beauty. And there’s fire as a catalyst for seed dispersal. I initiated our Courage to Lead program to help tend or reignite the fire in the hearts of leaders of community-based organizations in Southern California, where I live. Nonprofit leaders are the type of people who too often serve everyone else and neglect themselves. New challenges constantly arise, and these leaders are expected to figure out what to do and to lead their organizations forward. So many eyes are focused on them. The twenty leaders that responded to my invitation for our 13-month retreat series comprised an amazing group representing all kinds of organizations – including a preschool for the children of homeless families, an organization that fights domestic violence, a rehabilitation hospital, an after-school art program for at-risk youth, and the largest environmental nonprofit in our region. These folks are all heroes to me. I looked for a venue for our retreats that would be nurturing and reflective. Someone suggested I check out a monastery in the hills about Santa Barbara — Mount Calvary Retreat House. From the moment I visited, I knew this was the place. It had an amazing energy, a natural setting with stunning ocean and mountain views, and it felt very contemplative. The work of the monks there is hospitality, and they carry it off with graciousness. This Benedictine order has many common values with Courage work – a commitment to balance, silence, reflection, and living a life in “conversion” towards our ideal selves. 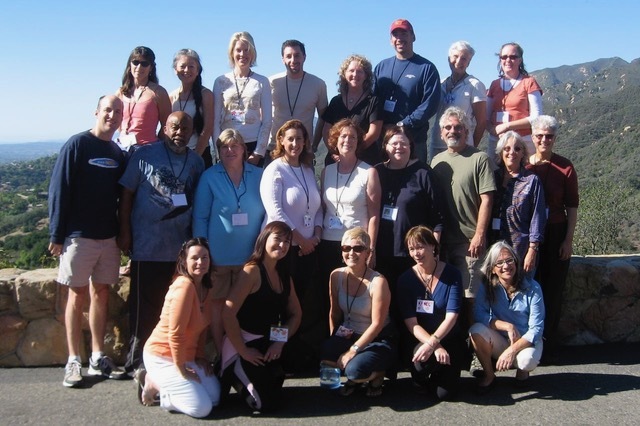 At our first two-day retreat (November 12-14, 2008), it was clear from the start how much these nonprofit leaders were thrilled just to be together. Someone said “this is the peer group I have always wanted, but never found.” Another person said she felt like she had “found another part of my tribe.” Here’s a group picture of us up at Mount Calvary. On November 13, the second day of this fall retreat, I awoke before dawn to hike up the mountain and watch the sunrise — serene, spectacularly beautiful, full of hope. This was followed by a silent breakfast with the monks. It’s hard to imagine a more peaceful beginning to the day, but it was not to last. As we worked together throughout the day, supporting each other in our looking at our own lives and leadership, the environment changed around us. The winds picked up more and more until we could hear the old monastery creaking around us. And it was warm, eerily warm. After years of drought, we in Southern California have come to dread days like this. So there we were, my co-facilitator Kim and I, with responsibility for the twenty nonprofit leaders we were there to serve, in a situation we had not planned for, and folks were looking at us to know what to do. It wasn’t until weeks later that I realized the irony of the parallels between the scenario we were thrust into and those our nonprofit leaders face regularly. We could have started barking orders and telling everyone what to do, but not only is that not our style, but frankly we weren’t sure ourselves the best approach! We also could have looked to our monastery hosts to direct us, but they didn’t seem clear either about the seriousness of the threat. So Kim and I tried to assess the danger, pulled together some emergency information, and then assembled our group to decide what they wanted to do. Some were less concerned, and others were quite anxious. We tried to make space for all to say their peace. And once the group decided to evacuate, we opened it up for suggestions – and got many useful ones. Turn your cars around so you are facing out, everyone has a buddy on the way down who knows the way, reconnect at a reunion spot down in town. Once we agreed on the plan, people went to quickly pack up their belongings, and then checked out two by two. One of our participants took this photo on the way down the mountain. When we all reconnected and everyone was accounted for, I left to be with my own family who was evacuating our own home, while Kim facilitated the group in deciding what they wanted to do. After some discussion, the group decided to cut short the retreat and head home. I would venture to say that none of us thought that Mount Calvary would be in flames a couple hours after our swift exit. The monastery had withstood prior fires, and the head monk that night thought they would be OK. (Fortunately, they decided to evacuate soon after we did.) But by morning, we had learned the sad news. Mount Calvary and many neighboring homes had fallen to the fire. This picture showed all that remained of the beautiful façade. As I’ve talked to members of our Courage to Lead group since the fire, everyone has processed this tragedy differently. And we’re still processing it. But it is extraordinary material for our program. Nonprofit leaders today are working in a financial crisis atmosphere that – like the fire – came on quite quickly, and they are having to figure out how to adapt in an unprecedented environment where there is lots of fear. What have I learned about fire from this experience? Things are lost in the flames, tragically, and other things are forged there. Our group is bonded with each other and the monks of Mount Calvary in a way it could never have been otherwise. Some beautiful and important things were lost in this fire, and yet where the seed may scatter and what may grow as a result, we can only imagine.